The only thing more startling than the flurry of tax proposals Democrats have unveiled in recent weeks is the full-throttle response they’ve gotten from the public. Representative Alexandria Ocasio-Cortez suggested a near doubling of the top income tax rate. Senator Bernie Sanders, who caucuses with the party, introduced a bill to raise taxes on dynastic heirs. And Senator Elizabeth Warren proposed a levy that has never existed in the United States: a wealth tax, assessed annually on America’s biggest fortunes. The soak-the-rich plans — ones that were only recently considered ridiculously far-fetched or political poison — have received serious and sober treatment, even by critics, and remarkably broad encouragement from the electorate. Roughly three out of four registered voters surveyed in recent polls supported higher taxes on the wealthy. Even a majority of Republicans back higher rates on those earning more than $10 million, according to a Fox News poll conducted in mid-January. Riding the momentum of a 40-seat pickup in the midterm elections, Democrats are bringing to the fore audacious policy ideas that have been mostly simmering on the sidelines. As the middle class continues to thin out and wealth concentrates among a tiny sliver of Americans, the party’s powerhouses are questioning economic verities that have stood for decades. Not since President Bill Clinton urged Americans to embrace a hands-off, neoliberal approach to markets — declaring in his 1996 State of the Union that “the era of big government is over” — have Democrats experimented with such a shift in fundamental economic assumptions. Taxes, deficits, spending, financial deregulation — everything is up for appraisal. The new terrain comes with risks, revealing potential philosophical and tactical fault lines among Democrats, who must decide whether to get out in front of the movement or exercise caution. Some hopefuls for the party’s 2020 nomination, certainly, are staking out more moderate positions — a group that includes former Vice President Joseph R. Biden Jr. and younger challengers like Senators Kamala Harris, Kirsten Gillibrand and Cory Booker. And it is an open question whether aggressively redistributive tax plans will continue to resonate with voters, or come to be seen as a move to the hard left that alienates the middle of the country. What is palatable politically and economically, though, has been refigured by Mr. Trump’s own unorthodox presidency — and by the brushoff Republicans gave the deficit when they passed a $1.5 trillion-tax bill in 2017 that primarily benefited upper-income households and corporations. Those developments are helping shoot-the-moon visions on the left — like “Medicare for all” or a “Green New Deal” to halt climate change with massive public investment — find firmer footing on political ground. The result is that ideas that have long nipped at the edges of the political conversation are now smack in the middle of it, and think tanks, industry groups and candidates are earnestly analyzing their costs and benefits. The latest string of ambitious tax proposals all “pass a plausibility smell test,” said Jared Bernstein, former chief economic adviser to Mr. Biden. At the World Economic Forum in Davos, Switzerland, for instance, billionaires and business school professors discussed Ms. Ocasio-Cortez’s views on tax rates. Ms. Warren has gone the furthest in marrying big ideas and granular wonkiness, with a plan that calls for an extra 2 percent annual tax not on income but on all assets — like stocks, real estate and art — owned by households above the $50 million level. The rate would rise to 3 percent on fortunes above $1 billion. The Massachusetts senator’s campaign estimates the policy would raise $2.75 trillion over the course of a decade from roughly 75,000 households, out of a total of 127 million, in the United States. Ms. Warren attached addenda from respected economists and legal scholars to head off skeptics, but questions about the plan’s practicality will inevitably persist. Sweden and other European countries have abandoned wealth taxes in recent years because of problems with enforcement. Ms. Ocasio-Cortez, of New York, hasn’t offered a concrete proposal. 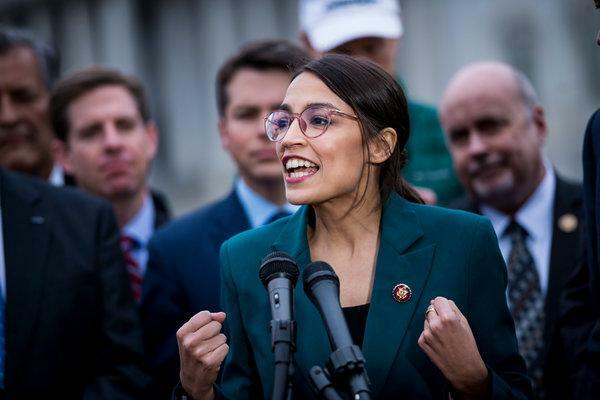 But her broad defense of high marginal rates for multimillionaires, floated during a “60 Minutes” profile, kick-started the current debate — and demonstrated her preternatural ability, at age 29, to shift the bounds of policy talk. In 2017, debating the Republican tax bill, Congress argued whether the top income rate should be reduced to 37 percent from 39.6 percent. (It was.) With one interview, Ms. Ocasio-Cortez got the country talking about whether the rate should zoom as high as 70 percent. According to estimates by the University of Pennsylvania’s Penn Wharton Budget Model, lifting the top rate as she has described would raise $353 billion. Other independent estimates figured it would affect roughly 16,000 households. Individuals can now leave their heirs about $11 million tax-free. According to the nonpartisan Center for Budget and Policy Priorities, the average rate on taxable estates in 2018 will be 16.5 percent. Mr. Sanders would lower the asset threshold to what it was in 2009, so that only the first $3.5 million inherited is tax-free. The next $6.5 million would be taxed at a 45 percent rate. Additional chunks of money would trigger higher rates — up to 77 percent on the value of estates above $1 billion. Wojciech Kopczuk, a Columbia University professor of economics, estimated that the Sanders plan would capture money from 8,000 estates per year that currently owe no estate taxes. Mr. Sanders would also eliminate dynasty trusts, which allow families to shelter colossal holdings from taxes as they pass from one generation to the next. His office estimated that the bill would raise at least $315 billion over 10 years. Aside from his policy particulars, Mr. Sanders has been explicit in his broader aims to restrain a homegrown aristocracy that inherits entrenched power and money. In announcing his tax proposal, he quoted Teddy Roosevelt’s warning about the dangers of a small class of enormously wealthy individuals “whose chief object is to hold and increase their power,” and underscored the moral and political imperative to put some limits on dynastic wealth. If such comments inspire supporters, they also reveal potential divisions among the rising crop of Democrats. The left-leaning Ms. Ocasio-Cortez, Ms. Warren and Mr. Sanders are all viewed as less business-friendly than Ms. Gillibrand, Mr. Booker and Ms. Harris, who have not made taxes on the rich a centerpiece of their public pitches. In that sense the latter trio is following the example set by Hillary Clinton in the 2016 campaign and President Barack Obama before her, with comparatively establishment-minded thinking on progressive taxation. Ms. Harris, for example, was asked at a Drake University town hall in Des Moines about the morality of multibillionaires in a society with so many poverty-stricken children; she responded by calling for more taxes on the top 1 percent. Yet the California Democrat’s language, approach and proposals have a distinctly different tone than, say, that of Mr. Sanders, and she has not focused her campaign so far on attacking the wealthy or warning about an oligarchy. Her tax bill offers credits up to $6,000 for families earning less than $100,000 a year, without providing many details of who would make up the difference. Ms. Gillibrand backs a broader estate tax and Mr. Sanders’ financial-transactions tax. Like Ms. Harris, though, her focus has been on bolstering people at the bottom and in the middle, with more generous tax credits for the working poor and middle-class tax cuts. Mr. Booker of New Jersey, the most recent entrant in the Democratic field, supports returning the estate tax to 2009 levels, as Mr. Sanders does, noting that inheritances widen the wealth gap and particularly disadvantage minorities. Mr. Booker has also opposed a loophole that enables heirs to avoid paying taxes on capital gains. But in the early days of his presidential campaign, he has avoided charged language about taxing the superrich and played on more familiar turf such as the carried-interest loophole, which benefits hedge-fund and private-equity executives. That tax break is so widely scorned outside Wall Street that even Donald Trump campaigned against it in 2016. A more traditional blend of fiscal conservatism and social liberalism can also be found among several self-designated centrists and pragmatists, like Mr. Biden and former New York City Mayor Michael R. Bloomberg, who officially registered with the party in October. Mr. Biden, who has not formally announced that he will seek the White House in 2020, has called generally for higher taxes on the rich and investment income, along with more generous tax credits for the working middle class. Mr. Bloomberg, a billionaire dozens of times over, previously supported reducing and simplifying corporate tax rates, though he denounced the Republican tax program that passed in 2017. And he backed increasing the earned-income tax credit to help lower-income working families. But Mr. Bloomberg, who has castigated Mr. Warren’s proposed wealth tax as disastrous and unconstitutional, rejects the premise that wealth has an insidious effect on democracy. And among potential Democratic presidential candidates, he is the only one who has continued to sound the deficit alarm, warning that ambitious proposals for health care or climate control could bankrupt the government. Mr. Bloomberg’s positions highlight tensions likely to arise between an activist wing eager to energize voters and an establishment wary of turning off moderates and independents who dislike President Trump but are alarmed by jeremiads about wealth. Democrats across the board may endorse the idea that the wealthiest sliver of Americans should contribute more to help pay for ambitious health care and education programs. Some may be leery, though, of policies that smack of class warfare. There are practical concerns as well, even if they are taking a back seat for the moment. In interviews, more than a dozen Democratic economists and policy advisers applauded the bold tax proposals while maintaining their preference for more test-driven reforms like closing loopholes, raising top rates and changing the rules around capital gains. Those familiar fixes are less splashy, but they avoid some of the administrative and enforcement hurdles that unconventional proposals, particularly a wealth tax, present. “Gradually and then suddenly” is how a character in Ernest Hemingway’s “The Sun Also Rises” explains going bankrupt. The same might be said of political tipping points. A midterm election that gave Democrats control of the House and brought in a vocal class of more liberal representatives is one reason the range of proposals has so quickly expanded. But just as important as that electoral victory was a previous one — by Mr. Trump — that showed bravura and brashness could prevail over conventional wisdom and caution. At the same time, enthusiasm for the suddenly popular propositions has deeper roots. Several ideas about taxes, public spending and deficits rattled around liberal circles for years, or surfaced during Mr. Sanders’s 2016 campaign, before their recent move to center stage. Over the last couple of decades, economists have produced terabytes of new economic data and research charting the effect of the neoliberal cocktail of deregulation, low taxes and cranked-up competition in a global economy. Among the most influential work: findings by the economists Thomas Piketty, Emmanuel Saez and Gabriel Zucman detailing the concentration of wealth. Using advanced computing technology and novel data sets, they cataloged the economic fallout that market forces have wrought with unprecedented specificity and range. They also outlined how a wealth tax could work. Mr. Zucman said he and Mr. Saez first started meeting with Ms. Warren and other potential presidential candidates in 2014. Last month, the two economists — both professors at the University of California, Berkeley — vetted her wealth-tax proposals and calculated the revenue estimates. Beyond taxes, ideas out of academia have also shifted the political conversation around deficits. Notably, there’s modern monetary theory, pushed by a group of economists led by Stony Brook University professor Stephanie Kelton. She argues that societal needs should determine public spending, not deficits. The call to end Washington’s obsession with red ink has attracted some other surprising advocates, who took a decidedly different route to get there. Lawrence Summers, Treasury secretary during the Clinton administration and the director of President Obama’s National Economic Council, and Jason Furman, chairman of the Council of Economic Advisers during the Obama administration, recently published an article in the journal Foreign Affairs declaring everyone should stop worrying so much about the debt. Government deficits matter, they said, just not as much as other things like investing in education, health care, persistent poverty or climate change. The next national elections are still nearly two years away, of course, and the list of potential Democratic presidential hopefuls stretches further than a Cronut line. Policy disagreements will sharpen. What should take priority now, veteran Democratic operatives are emphasizing, is the big picture, rather than brass-tacks policy debates. Previous PostPrevious Jeff Bezos Said He Was a Victim of Extortion and Blackmail. What’s the Difference?